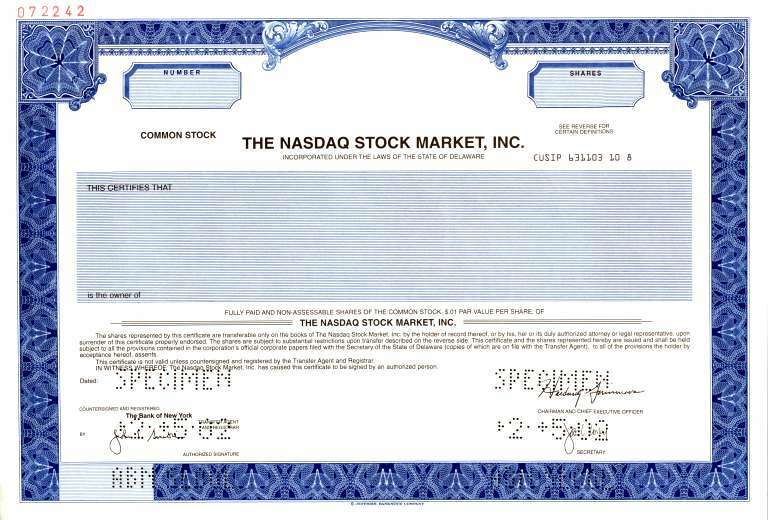 Beautifully engraved specimen certificate from the NASDAQ Stock Market, Inc printed in 2002. This historic document was printed by the Jefferies Banknote Company and has an ornate border around it with a vignette of the company's name. This item has the printed signatures of the Company’s Chairman, Hardwick Simmons and Secretary. NASDAQ was founded in 1979 by the National Association of Securities Dealers (NASD), who divested themselves of it in a series of sales in 2000 and 2001. It is owned and operated by the NASDAQ OMX Group, the stock of which was listed on its own stock exchange beginning July 2, 2002, under the ticker symbol NASDAQ: NDAQ. It is regulated by the Financial Industry Regulatory Authority (FINRA), the successor to the NASD. When the NASDAQ stock exchange began trading on February 8, 1971, it was the world's first electronic stock market. At first, it was merely a computer bulletin board system and did not actually connect buyers and sellers. The NASDAQ helped lower the spread (the difference between the bid price and the ask price of the stock) but somewhat paradoxically was unpopular among brokerages because they made much of their money on the spread. NASDAQ was the successor to the over-the-counter (OTC) system of trading. As late as 1987, the NASDAQ exchange was still commonly referred to as the OTC in media and also in the monthly Stock Guides issued by Standard & Poor's Corporation. Over the years, NASDAQ became more of a stock market by adding trade and volume reporting and automated trading systems. NASDAQ was also the first stock market in the United States to start trading online. Nobody before them had ever done this, highlighting NASDAQ-traded companies (usually in technology) and closing with the declaration that NASDAQ is "the stock market for the next hundred years." Its main index is the NASDAQ Composite, which has been published since its inception. However, its exchange-traded fund tracks the large-cap NASDAQ-100 index, which was introduced in 1985 alongside the NASDAQ 100 Financial Index. Until 1987, most trading occurred via the telephone, but during the October 1987 stock market crash, market makers often didn't answer their phones. To counteract this, the Small Order Execution System (SOES) was established, which provides an electronic method for dealers to enter their trades. NASDAQ requires market makers to honor trades over SOES. In 1992, it joined with the London Stock Exchange to form the first intercontinental linkage of securities markets. NASD spun off NASDAQ in 2000 to form a publicly traded company, the NASDAQ Stock Market, Inc. 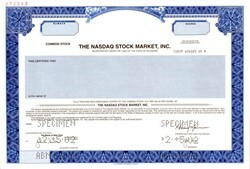 In 2006 NASDAQ changed from stock market to licensed national exchange. On November 8, 2007, NASDAQ bought the Philadelphia Stock Exchange (PHLX) for US$652 million. PHLX is the oldest stock exchange in America—having been in operation since 1790. To qualify for listing on the exchange, a company must be registered with the United States Securities and Exchange Commission (SEC), have at least three market makers (financial firms that act as brokers or dealers for specific securities) and meet minimum requirements for assets, capital, public shares, and shareholders. In February 2011, in the wake of an announced merger of NYSE Euronext with Deutsche Börse, speculation developed that Nasdaq and IntercontinentalExchange (ICE) could mount a counter-bid of their own for NYSE. Nasdaq could be looking to acquire the American exchange's cash equities business, ICE the derivatives business. As of the time of the speculation, "NYSE Euronext’s market value was $9.75 billion. Nasdaq was valued at $5.78 billion, while ICE was valued at $9.45 billion." Late in the month, Nasdaq was reported to be considering asking either ICE or the Chicago Merc to join in what would probably have to be, if it proceeded, an $11–12 billion counterbid. EASDAQ (European Association of Securities Dealers Automatic Quotation System) founded originally as a European equivalent to NASDAQ, it was purchased by NASDAQ in 2001 and became NASDAQ Eur03, it shut down operations as a result of the burst of the dot-com bubble. In 2007, NASDAQ Europe was revived as Equiduct and is currently operating under Börse Berlin. In 2013, NASDAQ was approached by private equity firm Carlyle Group about taking the exchange operator private, but the talks fell apart over a disagreement on price.